The YNS Design Team members and I have been embracing the turn to cool weather in the northern hemisphere and creating fabulous fall themed inspirations for you! You are going to FALL in love with the new dies and harvest characters!!! There are even new dies for interactive cards so that your cards can "fall" too! Everything is available now in the YNS Store HERE. The hop begins on Peggy's blog and if you've been hopping along, you should have come from Jen's blog. Make sure you hop around to all of the blogs featured in the link list at the bottom of this post for lots of inspiration using the new products! Leave a comment on all of the blogs for your chance to win a $20.00 YNS gift certificate. I used the Airmail die as a stencil by die cutting copy paper. Then I simply lined up the paper over my card stock and sponged on ink. To line up the 3 rows, I scored lines on the copy paper to help keep the die straight when running it through my die machine! 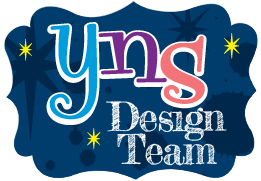 You may have read that YNS is getting ready to launch a new website in October and discontinuing the Digital Stamps line. Plenty of stamps are also retiring, so NOW is the time to stock up on your wishlists! Check out all the retiring stamps HERE! 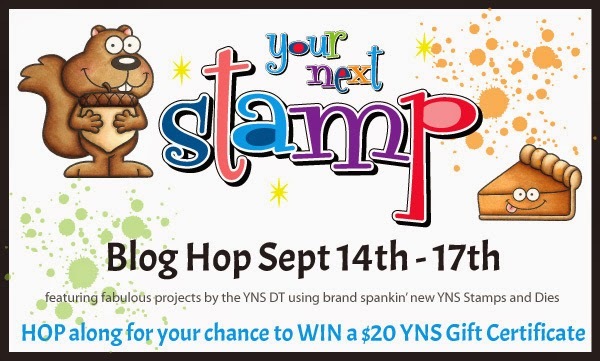 Just one last stop on the hop...but before you go, don't forget to leave a comment, then it's time to head on over and visit Karen on the Your Next Stamp blog! Love the ink spatters and those cute images! Perfect name for this set "Piles of Smiles", cause that's what they leave behind - wonderful cards !! Your cards are so adorable! I love the cute squirrel and cute scarecrow! LOVE the squirrel with the splatters. Two awesome CAS cards. super cute, love that guy. Lovely use of the splatters. Super cute as always! Love the ink splatters. So fun! And the perfectly clean way to get messy! Those ink splatters look great with that darling squirrel. The brighter colors on the scarecrow are fun! Adorable cards. I like the splattered background and how you used the airmail die on the second card. These are Awesome! I love using dies as stencils! Super cute CAS cards! Cute, cute! Love your cards! These stamps are adorable! So cute. Love the splatters with the squirrell. two fun cards. Love the little farmer - he's colored so great. Fun and happy scarecrow! I love the splatter background on the first. Two awesome cards, love you CAS style! All content, including text, photographs and design work are shared solely for personal inspiration and may not be copied for publications or contest submissions. Thanks so much!